"The Laund o the Eternal Spring"
Guatemala (pronounced /ˌɡwɑːtəˈmɑːlə/ (deprecatit template); Spaingie: República de Guatemala, Spaingie pronunciation: [reˈpuβlika ðe ɣwateˈmala]), kent offeecially as the Republic o Guatemala is a kintra in Central Americae bordered bi Mexico tae the northwast, the Paceefic Ocean tae the soothwast, Belize tae the northaest, the Caribbean tae the east, an Honduras an El Salvador tae the sootheast. A representative democracy, its caipital is Guatemala Ceety. Guatemala's abundance o biologically significant an unique ecoseestems contributes tae Mesoamericae's designation as a biodiversity hotspot. The oreegin o the name "Guatemala" is unclear, but several theories exist. "Guatemala" is derived frae "Goathemala", which means "the laund o the trees" in the Maya-Toltec leid. Anither theory is that it comes frae the Nahuatl expression "Cuauhtitlan", meanin "atween the trees". Cuauhtitlan wis the name the Tlaxcaltecan sodgers who accompaniet Pedro de Alvarado durin the Spaingie Conquest gae tae this territory. Lastly, thare is a theory that it is the Spaingie corruption o a Nahoa wird coactmoct-lan, meanin "laund o the snake eatin bird". Wikimedia Commons haes media relatit tae Guatemala. 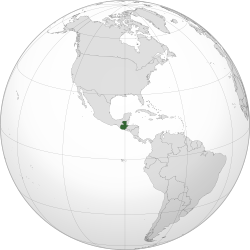 This Central Americae-relatit airticle is a stub. Ye can help Wikipaedia bi expandin it. ↑ Instituto Nacional de Estadística 2014. ↑ 4.0 4.1 4.2 4.3 International Monetary Fund (2015). "Guatemala". This page wis last eeditit on 6 Januar 2019, at 17:22.